“Many hairstreak butterflies have an elaborate false eye near the edge of their hindwing, often with slender tails that resemble antennae, creating the impression that the back of the insect is in fact the front.” This quote is from “A Buzz in the Meadow,” a great book by Dave Goulson about the natural history of a French farm. So is that clever or what? I see many butterflies with bits missing out of their wings where birds and other predators have taken a swipe at them. In order to confuse the birds further they usually do a swift 180 turn when they land so the bird thinks their protein-rich body is at the opposite end of where it really is … thereby giving the bird a bit of hindwing but preserving the body of the hairstreak. Saved to fly another day! Imagine how many generations of butterflies it took to evolve those two orange false eyes and the inclination to land with a quick reverse of direction. Apparently eye spots frighten off predators. Certainly they add to the beauty of the butterfly for we who value beauty. Huisache Tree Oils – $2000 a pound? The HUISACHE tree is blooming in Texas. Shall I handpick a ton (or 2 or 3) of those small orange flowers and press the oil out of them? These trees have a pleasant, fresh, violet-like smell which drifts on the breeze, tickling your nose and your memories. In the 1800’s the French perfumers imported Huisache trees and cultivated them in order to extract the oils and use them in perfumes. They devised a method of crushing the flowers with coconut oil or cocoa butter to extract the scent. That is why the oil was priced at $4,400/ kilogram (2.2 pounds). This product was called cassie oil. I invite you to come to Texas and gather a few tons of tiny, fluffy, orange balls and press the oil out of them….or just cover yourself in coconut oil and rub lots of orange flowers on yourself until you achieve the scent you want. You might attract a Crimson patch butterfly. Perhaps you will have a White Peacock butterfly land on you so you do not have to chase this flitter, flitter, fly-away guy around a 100 acre garden in order to photograph him. Anything is possible! Perched on a tree about head-high is a plain black-brown butterfly who slowly begins to open his wings to bask in the sunshine. As he does so, a sliver of iridescent blue appears. He could have been an old brown leaf until he unfurls his black and blue stripes to the sun. The white dots dazzle the viewer of the Mexican Bluewing. A mud-brown leaf lying on a rock shifts slightly revealing that he is a living butterfly. I am unimpressed and snap a casual photo but then notice that if I look closely with the sun behind him he has a red-orange streak on his wing. He prepares to leap into the air where both wings open wide showing an intense orange flash. It is a Tropical Leafwing! What a transformation from plain to breathtaking color. With the sun climbing overhead and lighting the fringed edges of the Questionmark butterfly it is obvious that this is a.spectacular specimen. Golden with chocolate dots scattered over his wings he seems too beautiful and fragile to exist. The morning sun warms him and he drifts away to conduct his life among the Hackberry trees of the Rio Grande Valley. 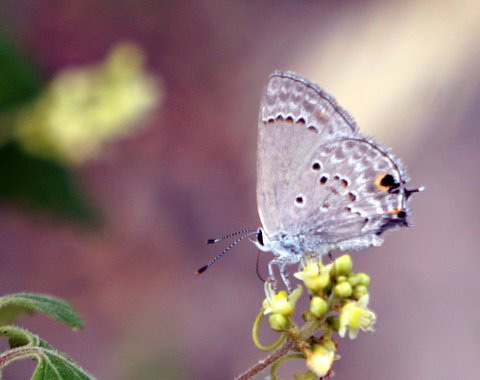 Hot, humid air hangs over the beds of Blue Mist Flower and hidden down in the depths is a tiny one inch butterfly tightly closed and seeming to be a wrinkled leaf. As the sun climbs higher he emerges to fly from flower to flower flashing his metallic blue wings. The iridescence makes it impossible to miss him but he flies fast and trying to take his picture as he flits erratically around is difficult. He deserves his name of Blue Metalmark. A joy to see. The Bordered Patch butterfly is somewhat nondescript with his wings closed but he still shows you what to expect when the wings open…yellow-orange stripes and glowing white dots on a black background He is a big, showy butterfly who floats above the flower beds with slow wing beats.